Arrow fans, you better get ready for a familiar face to return to The CW. For some time, fans have been wondering if Deathstroke will make a return to the show. Arrow brought back the DC Comics villain for the show’s milestone 100th episode, but fans have not heard from the franchise since. However, it looks like one of the show’s stars is giving fans a massive teaser about the character, and it will make dreams come true for some viewers. Yes, you guessed it. Deathstroke is returning with Manu Bennett. Over on Twitter, Stephen Amell gave fans a heads up on the actor’s return. The star posted a picture with Deathstroke’s helmet sitting on a forest floor. “Desperate times call for desperate measures. Welcome back @manubennett,” Amell wrote. There is no official word on how Deathstroke will fit back into Arrow, but fans have a hunch that the villain may reappear as an unexpected ally rather than a baddie. In a recent interview with Entertainment Weekly, executive producer Wendy Mericle said Oliver Queen would team up with one very unexpected person to take down Prometheus for good. Last month, Amell also teased fans about the return of Deathstroke and the Island he found himself stranded on. The actor posted a photo of the villain's burnt mask spread on the shore of the Island. The actor captioned the image, writing, "Hello old friend." And, now, it looks like the Green Arrow will be reintroduced to more than just his foe's old headgear. Oliver (Stephen Amell), Team Arrow, ARGUS and the SCPD kick off a citywide manhunt for Adrian Chase (Josh Segurra). Helix tells Felicity (Emily Bett Rickards) they have a way to find Chase but they will need something big, and illegal, from her in return. Joel Novoa directed the episode written by Speed Weed & Elizabeth Kim. Joel Novoa directed the episode written by Speed Weed & Elizabeth Kim. 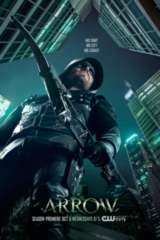 Based on the characters from DC, ARROW is from Bonanza Productions Inc. in association with Berlanti Productions and Warner Bros. Television, with executive producers Greg Berlanti (The Flash, Supergirl), Marc Guggenheim (Eli Stone, Percy Jackson: Sea of Monsters), Andrew Kreisberg (The Flash, Supergirl), Wendy Mericle (Desperate Housewives, Eli Stone) and Sarah Schechter (Supergirl, Blindspot).